Limited Run Games • View topic - What else do you collect? Do you collect anything else? Funko Pops? Comics? Old spoons or stamps? Do you still have everything you collected as a kid, say sports cards or comics? Re: What else do you collect? At one time I had a big Sports card, Comicbook and Super Hero card collection. Sold the comics this year, since the value has tanked since the late 90s/early 2000s. Nothing else right now aside from that and videogames. I have some Funkos, but thankfully I stopped soon enough in my Funko craziness. I'll probably try to sell most of them this year and keep just my favs. My wife and I collected TV-Series DVD-Boxsets. (Then Netflix came around the corner and I started collecting games). We still have them so maybe we continue that at some point. Since a few years we are buying some Lego-Sets (mostly Architecture, Ideas and the Creator Expert cars). Best1989 wrote: VGM OST vinyl records! Same with me, along with some classic anime records. I also collect non-TCG Pokemon pins (I have around 30~) and anime Blu-rays (have around 30~ as well). I think this has been brought up before on the forum some time ago, but I'm pretty picky about the anime I spend money on and add to my collection, so it has remained fairly small over the years. That, and some Blu-rays can be quite expensive as they go out of print quickly in the West - meaning I missed the chance to buy them in the first place. I've got a few Thousand gaming magazines stored away in my attic that i've gathered over the years from the 90ies up until now i guess. i tought about throwing some of them out but it would be such a waste to do so. Anyone wanting to sell off their comics, I'm always on the lookout for pre-1980 stuff and post 1980 key issues. As for me, I collect comics, animation cels, puzzle boxes, some trading cards, Blu-rays & DVDs (mostly Blu-ray), CDs, and other random things that catch my eye. I have collected comic books since I was a kid. I still have my original collection, but my current buying habits are mostly restricted to Spider-Man: Renew Your Vows, anything by Adam Warren, and the odd variant covers by J. Scott Campbell. I also collect Funko POP! figures. My focus is primarily on Spider-Man characters, but I also have a smattering of other figures. I easily have over 200 of these things, with almost half of them being Spider-Man related. I should probably count them one of these days. Recently, thanks to places like 2nd & Charles and Half-Price Books, I have started collecting the Xanth series of fantasy novels by Piers Anthony. As a kid, I had discovered these books in my school's library. As such, I only ever owned one or two volumes since I could always just check them out from the library. Currently, I have about twenty of them, including a few first editions. While I have cooled off on this a lot, I still enjoy collecting action figures. I have crates full of classic Marvel figures, McFarlane Toys and Japanese imports. Speaking of the latter, I pick up a few S.H. Figuarts here and there; mostly from Sailor Moon, Power Rangers and Dragon Ball. On the Marvel front, I collect a good bit of the Marvel Legends figures. Rarely do I go after full sets, but I have assembled a handful of the Build-A-Figures. Again, there is a heavy slant towards Spider-Man with these. Other than that, it is mostly video games. Tekkaman wrote: I have collected comic books since I was a kid. I still have my original collection, but my current buying habits are mostly restricted to Spider-Man: Renew Your Vows, anything by Adam Warren, and the odd variant covers by J. Scott Campbell. When I was a teen, I read the first 10 or so Xanth books. I have a graphic novel, or used to (not sure if I still have it actually), as well. I really enjoyed those first 9 books, but somewhere along the way Piers Anthony mad a few continuity errors, and at that time that sort of thing REALLY bothered me, so I gave up on the series after that. Still, it's a fun series, and probably helped fuel my love of puns. And yeah, I like S.H. Figuarts as well, though I only have a few. I'd like to pick up some of the Monsterarts as well (Godzilla stuff), but those are expensive. i may be interested in those Funkos keep me posted! I don't collect Funkos, but I have one that I got went I went to see The Last Jedi on opening day. It was included with my ticket purchase. It's not some special release or anything; I'm pretty sure it's just a regular Pop that you can buy in stores. It's Luke Skywalker (Last Jedi version). If you're interested in it let me know. Apart from games, I collect D&D novels (all series, almost complete) Warhammer novels (all series, nowhere near complete), Warhammer 40k (Tyranid and Necron). And of course a huge amount of (older) comics. Oh I missed this thread. So, I thought I would provide an update regarding my original post. Funko recently created / co-opted an iOS app that allows you to track your collection. As it turns out, I have just over 400 POP! figures. However, my wife collects as well and she has around 150, so that means there are over 500 POP! figures in my house. I knew it was a lot, but seeing the number was very shocking. Still, as long as they keep cranking out Spider-Man figures, I'll keep buying 'em! Also, since my last post, I learned that the Spider-Man: Renew Your Vows comic was unceremoniously canceled with issue # 24. From what I can gather, since Peter and MJ are back together again in the main comic series, MARVEL probably didn't see the point of keeping this "What if..." story going. The characters did show up in the Spider-Geddon event (a follow-up to the Spider-Verse event from a few years ago), but it's still sad to see their story end so abruptly. As such, my regular visits to the comic book store are at an end...for now, I'm sure. Tekkaman wrote: So, I thought I would provide an update regarding my original post. Funko recently created / co-opted an iOS app that allows you to track your collection. As it turns out, I have just over 400 POP! figures. However, my wife collects as well and she has around 150, so that means there are over 500 POP! figures in my house. I knew it was a lot, but seeing the number was very shocking. Still, as long as they keep cranking out Spider-Man figures, I'll keep buying 'em! I didn't read but a few stories in that universe (including the crossovers in Spider-Geddon), but it was a good universe! Having the entire Parker family fight crime was fun. I may pick up more of the back issues at some point. Hopefully the final issue was a good sendoff. P.S. Little known Buraddo comic fact, but What If was my absolute favorite comic book series as a kid, and maybe even of all time. I loved reading alternate universe stories, because the writers were basically allowed to do anything they wanted! I daresay that Uatu, The Watcher is even my favorite Marvel superhero. And yes, he was a hero in every sense of the word. He broke his oath multiple times to save Earth, though few knew it. I was sad when they killed him. BuraddoRun wrote: I didn't read but a few stories in that universe (including the crossovers in Spider-Geddon), but it was a good universe! Having the entire Parker family fight crime was fun. I may pick up more of the back issues at some point. Hopefully the final issue was a good sendoff. Well, the story arch finished, but the overall narrative did not. So, you're not left on a cliffhanger, but you also aren't getting any sort of loving send-off to these characters or this universe. I don't know why they couldn't spare one more issue to accomplish that. Plus, it would have brought the run up to 25 issues which would have made my OCD a lot happier. BuraddoRun wrote: P.S. Little known Buraddo comic fact, but What If was my absolute favorite comic book series as a kid, and maybe even of all time. I loved reading alternate universe stories, because the writers were basically allowed to do anything they wanted! I daresay that Uatu, The Watcher is even my favorite Marvel superhero. And yes, he was a hero in every sense of the word. He broke his oath multiple times to save Earth, though few knew it. I was sad when they killed him. Did we just become best friends? Yup! I am obsessed with the What If series. Every time I find a new comic book shop, I make clearing them out of their What If collection my first priority. I adore the stories they create for those books and the amazingly inventive ideas they come up with. I just wish that more of them ended happily, but I suppose that is MARVEL's way of showing that the events of the main universe are the only true way things could have happened. It is a shame they don't keep that book as an ongoing series anymore, but I am glad that they still release a few standalone issues every year or so. I enjoyed What if back in the day, late 80s/early 90s, gave Marvel a chance to explore options. I used to be big into comics and preferred Marvel over DC for the most part as a kid, early to md 90s. I enjoyed stuff like the Fantastic Four, Uncanny X-Men, Maximum Carnage series and anything else Spiderman. I did get more into classic Batman and with the death of Batman and Superman I became more interested in DC. Tekkaman wrote: Did we just become best friends? Yup! I am obsessed with the What If series. Every time I find a new comic book shop, I make clearing them out of their What If collection my first priority. I adore the stories they create for those books and the amazingly inventive ideas they come up with. I just wish that more of them ended happily, but I suppose that is MARVEL's way of showing that the events of the main universe are the only true way things could have happened. It is a shame they don't keep that book as an ongoing series anymore, but I am glad that they still release a few standalone issues every year or so. Ha! I do the same! Well, I look anyway, but I don't always clear out their copies. But, just this week, I completed my set (for now) by picking up my last 3 missing back issues! I now have every issue of What If from all the volumes and the various specials and one-shots. The only thing missing are some of the newer variant covers, which I may or may not try to pick up eventually. And of course I'll be looking to get the new issues that come out semi-yearly in the future. Did you ever read Exiles? That was a fun series, too, as the team of heroes from various realities teamed up to "make things right" like in Quantum Leap. I have all of those issues as well. The first series was great until Claremont took over, which is crazy since he was such an awesome storyteller for X-Men. But he killed Exiles IMO, and New Exiles just didn't draw me in. The 2nd series, though short, was very good I thought. And the 3rd, which just ended recently, was OK. I didn't love it, but didn't hate it. I thought the rogue Watchers were a fun idea but the execution was pretty lame. Those guys are supposed to be Cosmic Powerhouses. Uatu, though he wouldn't do it, could have mopped the floor with the Exiles and the rogue Watchers! kube00 wrote: I enjoyed What if back in the day, late 80s/early 90s, gave Marvel a chance to explore options. I used to be big into comics and preferred Marvel over DC for the most part as a kid, early to md 90s. I enjoyed stuff like the Fantastic Four, Uncanny X-Men, Maximum Carnage series and anything else Spiderman. At least you still have a piece of it in you, right? Your avatar is Venom, after all. Do you guys remember some of your favorite issues? My favorite What If is Vol. 2, # 25. One of the devastatingly dark stories, for sure, but also one with amazing teamwork and sacrifice. The heroes and villains had to work together to defeat Set, and it was just such an epic story! Plus the end left things open for a sequel that could have happened in the proper Marvel Universe. I kept hoping someone would revisit that and bring it to Earth 616, but as far as I know that never happened. I also loved Vol. 2, # 41, because in this one The Watcher ended up breaking his vow in order to save Earth by DIRECTLY fighting Galactus! Good stuff! Last edited by BuraddoRun on Mon Apr 15, 2019 10:40 am, edited 1 time in total. BuraddoRun wrote: I completed my set (for now) by picking up my last 3 missing back issues! I now have every issue of What If from all the volumes and the various specials and one-shots. The only thing missing are some of the newer variant covers, which I may or may not try to pick up eventually. And of course I'll be looking to get the new issues that come out semi-yearly in the future. Wow! I don't have anywhere near a complete set. Congratulations! BuraddoRun wrote: Did you ever read Exiles? That was a fun series, too, as the team of heroes from various realities teamed up to "make things right" like in Quantum Leap. I have all of those issues as well. I haven't read it, but I did hear that the book made references to some of the one-off universes created during the various runs of What If. I will have to get around to reading at least the first series. Thanks for the review/recommendation! BuraddoRun wrote: Do you guys remember some of your favorite issues? I don't remember issue numbers, but most of my favorite stories are Spider-Man related. The two-part story of "What If Spider-Man Never Married Mary Jane?" and "What If Spider-Man Married the Black Cat?" is definitely one of my favorites. Also, because I love the original story-line as well as the incredibly talented Mike Wieringo, the posthumous release of "What If The New Fantastic Four Remained A Team?" was a real treat on so many levels. I also love how the Spider-Man: Into the Spider-Verse film made a reference to Spidey's caped costume from "What If Spider-Man Had Never Become A Crimefighter?" There are just so many good stories in that series. Oh! On the subject, did you hear that one of the new animated series being produced for Disney+ is going to be a What If? cartoon? They've already stated that it will exclusively deal with MCU plotlines, but the teaser image showing Peggy Carter as Captain America really has me intrigued and excited! Who would ever have thought this series would get its own cartoon? It's such an amazing time to be a comic book fan! Tekkaman wrote: Oh! On the subject, did you hear that one of the new animated series being produced for Disney+ is going to be a What If? cartoon? 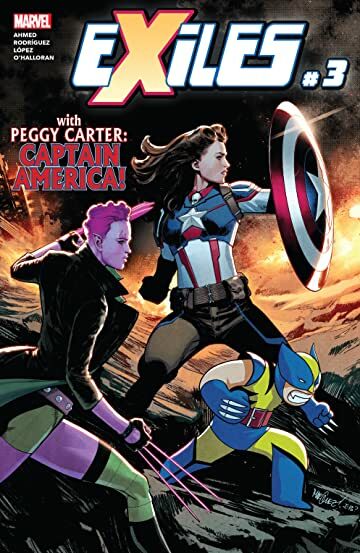 They've already stated that it will exclusively deal with MCU plotlines, but the teaser image showing Peggy Carter as Captain America really has me intrigued and excited! Who would ever have thought this series would get its own cartoon? It's such an amazing time to be a comic book fan! For real!!?? That's so awesome! That tempts me to subscribe to their streaming service, but hopefully they'll put it on home video as well. It's funny, though. Peggy Carter Captain America first appeared in the Marvel Puzzle Quest mobile game, I believe. Then she joined the comic universe in Exiles (most recent series). She's a pretty cool character! But man, yeah, that's exiting news! I'm glad you told me because I had no idea!